Exciting 3 in 1 plush animals, reversible to pillow/blanket. 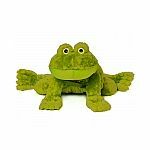 Stop by to see our fun animals featured in our Zoo & Safari Collections along with our new lines for 2009 of Wildlife and Insect Zoobies. Take a walk on the WILD SIDE! Stop by the booth and see Ryan Treft's special Zoobie dance!